Kyung Hee University is gearing up to realize the true meaning of globalization. Choue In-won, 53, president of the school, revealed his ambition for globalization through the school's new ``Global Campus'' in an interview with The Korea Times. To maximize its internationalization, Kyung Hee has long worked to make its campus in Gyeonggi Province, a place of global education and today will declare a name change from ``Kyung Hee University Suwon Campus’’ to `` Kyung Hee University Global Campus’’ with its vision. In order to give shape to his plan, Choue will set up a ``Kyung Hee Global Studio’’ in civic and cultural places around the world. In the first step, it will set up studios on every continent; North and South America, Asia, Oceania and Europe. There, the school will invite prominent scholars or world celebrities to lectures and conferences in cooperation with Kyung Hee Cyber University, its sister school. New York will be the first place for a ``Kyung Hee Global Studio’’ and the students can meet world leaders who are working at the United Nations from the beginning of next year. Followed by the New York studio, the school will open more academic centers one by one around the world. ``I want to foster open-minded and global-minded students who can accommodate themselves to the rapidly changing world through our global projects,’’ Choue said. In accordance with his globalization vision, Choue introduced a new term for the ideal university in the 21st century _ ``transversity’’ _ which he also mentioned in his keynote speech at the UN Department of Economic and Social Affairs conference, Vienna, Austria, this year. ``Traditionally, universities have space limits. Today’s society has to overcome this geographic limit. Transversity means a new type of university where academic knowledge and practice communicate and create new movements. Cyber universities could be part of the transversity,’’ Choue said. In the concept of transveristy, there is no boundary between different studies or between universities and research institutes, civic groups, media and international organizations. ``This is what I call transversity, those groups communicate surpassing barriers through the Intenet,’’ he said. Choue also stressed the proactive role of universities; leading society changes and serving society with academic knowledge and information. Regarding the recruitment of professors, the president said he wants to invite scholars with creativity, as distinct from the number of their research papers and theses. 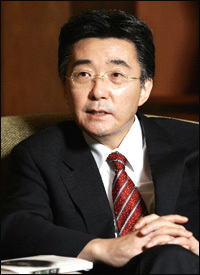 Also, Chou has asked professor hopefuls at the school to improve their abilities to link their majors to other studies. Some 44 departments at Kyung Hee University will have more autonomy to foment policies according to their needs so that the school can be more dynamic and harmonious. On the global campus, the keyword will be ``back to humanities,’’ as he strongly believes it doesn’t help students much to master professional skills at universities. ``Simple knowledge and skills will not work long as the world is changing so quickly. Hence students need to learn how to apply what they know and solve problems through liberal arts,’’ he said. ``Global campus students will not be constrained by severe competition for landing jobs. Instead, they can enjoy an academic environment where they can get internships at the UN and on global programs with world universities both online and offline,’’ he added. In addition, Choue will bring a change in university culture and create an educational environment that enables students to concentrate on their studies. As part of efforts to do this, he plans to remove noisy events and discursive placards although this might meet resistance from some students.